For the original Japanese game released on the Famicom Disk System, see Super Mario Bros. 2 (Japan). Super Mario Bros. 2 is a platformer developed and published by Nintendo for the NES. It was released in North America in October 1988, Europe on April 28, 1989 and Japan on July 14, 1992. The game was also remade as part of the Super Mario All-Stars collection for the SNES, released on August 1, 1993 in North America and December 16, 1993 in Europe. It was rereleased on the Wii's Virtual Console in Europe, Australia and New Zealand on May 25, 2007 and North America on July 2, 2007. It is also in Super Smash Bros. Brawl as one of the unlockable game demos in "Masterpieces." Unlike the majority of other Mario titles, SMB2 was not developed from an independent point, but rather it is a redesign of the Japanese Famicom Disk System game Yume Kōjō: Doki Doki Panic. Nintendo's original sequel to Super Mario Bros. was released in Japan as Super Mario Bros. 2 in 1986, however because of that game's perceived difficulty and its close similarities to the original game, Nintendo decided not to release it in the West at that time. The redesigned Western version of Super Mario Bros. 2 was released in Japan in 1992 under the title Super Mario USA (スーパーマリオUSA, Super Mario USA? ), and in 1993 the original Japanese version was released to the rest of the world as "Super Mario Bros.: The Lost Levels" (part of the Super Mario All-Stars collection for the SNES). Because SMB2 is a redesign of a non-Mario game, the game differs greatly from the original Super Mario Bros. The game has sold over ten million copies, was the 3rd most sold title on the Nintendo Entertainment System and was critically acclaimed at the time. 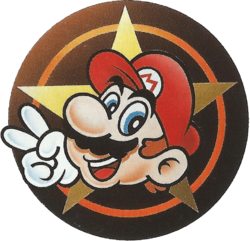 Many elements from Super Mario Bros. 2 have since become part of the Mario series canon and the repertoire of recurring elements. In addition to being remade with upgraded graphics in the Super Mario All-Stars collection, that remake became the basis for the Super Mario Advance game, which was a launch title for the Game Boy Advance. The GBA edition contains additional enhancements such as digitized voice, new enemies composed of very large sprites, and the Yoshi challenge. When Mario opened a door after climbing a long stair in his dream, another world spread before him and he heard a voice call for help to be freed from a spell. Super Mario All-Stars title screen for Super Mario Bros. 2. Nintendo Power's first issue featured Super Mario Bros. 2 on the cover. This page was last edited on 29 September 2015, at 05:47. This page has been accessed 120,757 times.